Ladies and gentlemen, I present our weapon against the alien hordes: the simple honest goodness of British baking. The first step is to lure alien scouts with the onion and chive bread (not shown actual size). A hard part of this step is resisting bopping the alien scout with a convenient stick upon his appearance. The next stage is waiting for the fleet to arrive, brought by the favourable reports from the scout. ("omg they has bredz! come see!). Then it simply remains to trap the alien fleet as they attempt to steal the bread. For this you can use a large tea towel. I wouldn't use a clean one. In the event of the alien invasion fleet being larger than can be contained in a tea towel then an old bedsheet can be used. 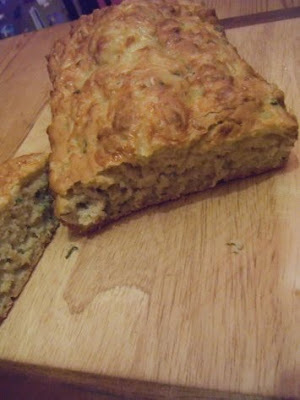 Unfortunately you will not be able to eat the onion and chive bread used to lure the aliens- it should be discarded due to contamination. It is therefore wise to make another loaf at the same time to eat while you wait for the alien fleet to turn up. Once you have your alien fleet contained in your tea towel or bedsheet it is time to deal with them. For this you will need a stout jiffy bag or other brand of padded envelope and a fat marker pen. Simply place the fleet in the jiffy bag and seal firmly, with sellotape if you don't trust the built-in sealing mechanism, then mark the envelope "Outer Space, anywhere, doesn't matter, not near Earth please" and take it to the Post Office. If they ask be sure to tell them that it doesn't contain a letter or they will charge you more. That's all you need to know about dealing with alien invasion fleets! This is terribly useful, especially the tea-towel tip. We are very well prepared for catching aliens with tea-towels, as none of our tea-towels has been clean since at least 2004. Ian and I often discuss what kind of traps to set for various creatures, and the results of our research are set out in the table in this post. I'm glad you spend your time thinking about these sensible things as well. Carry on.